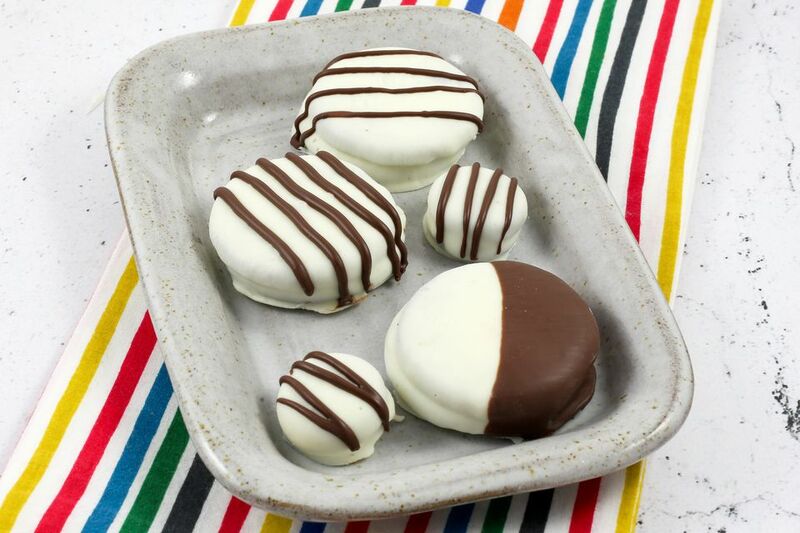 White chocolate dipped Oreos take only minutes to fix, and they are always a hit. The cookies can be dipped in plain white chocolate or a combination of white and then dark chocolate for black and white Oreos. To decorate them with stripes, fill a pastry bag or small food storage bag with melted dark wafers or colored white wafers and drizzle it over the white-coated cookies. These are fabulous treats that you can embellish with sprinkles, colored sugar, or candies for any holiday or season. They're great for lunchboxes, too. Ghirardelli melting wafers make an excellent coating that is not too thin and not too thick. The white wafers can be melted and colored with food coloring. Dip a combination of regular Oreos and Mini Oreos. Put your spin on these yummy cookies. If you are using sprinkles, make sure you decorate the cookies while they're still wet. If you are drizzling with another color or dipping them in two colors, let the first coating dry before dipping them or drizzling them with the second color. Optional: Sprinkles, colored sugar, food coloring, etc. Place a bowl over simmering water and add the melting wafers or almond bark; heat, stirring until the wafers have melted. Alternatively, heat the wafers or almond bark in a microwave-safe bowl for about 45 seconds to 1 minute, stirring every 15 seconds. Repeat with another bowl if you are using two or more colors. If the melted wafers are too thick, add shortening–about 1/2 teaspoon at a time–until you reach a good dipping and coating consistency. Spread a sheet of wax paper or parchment paper out on the countertop. Dip an Oreo in the melted wafers and lift out with a fork. Tap the fork gently on the side of the bowl until most of the excess chocolate has dripped off. Gently slide the cookie out onto the paper. Repeat with the remaining cookies. Decorate with sprinkles while the cookies are still wet or let them dry thoroughly and then drizzle with melted dark wafers or another color. Refrigerate the dipped Oreos for 15 to 20 minutes so the coating will set completely. Serve your dipped and decorated Oreos and enjoy! You can store the chocolate-dipped Oreos at room temperature in a sealed container for up to two weeks. They don't have to be stored in the refrigerator as the melting wafers have a high enough melting point to be stable at typical room temperature but keep the container away from heat sources. Freezing chocolate-dipped cookies is often not recommended because dark chocolate can develop a white "bloom" when defrosted. This is less of a concern with white chocolate-dipped cookies. The Oreos are a dry cookie so freezing won't change the consistency. Another concern is the coating may crack when defrosted. To freeze the cookies, place them in layers separated by wax paper in a sealed container. Got Dried Mangoes? Dip Them In Chocolate!